Our Fortnite: Battle Royale Settings guide contains a list of the best PC and console graphics and sensitivity settings you need to make your game smoother and your aim sharper. Getting ahead of the competition in Fortnite requires a healthy dose of tactical nous, not to mention some serious survival instincts. That's not all though, as you'll need sharp aim to gun down your opponents and a silky-smooth frame rate to ensure you won't miss a beat. It's surprisingly easy to ignore the importance of these two factors though, especially if you've grown used to playing Fortnite - or any other competitive game for that matter - without tinkering with the options menu. Your chances of survival can be severely hamstrung by poorly optimised video settings, and an overly jerky aim sensitivity can results in terrible aim issues. If you're a newcomer to Fortnite: Battle Royale, or even if you've been a Battle Pass veteran for a while but need some simple advice to up your game even further - we've got you covered. Below we've put together a number of handy walkthrough that'll help you boost FPS and improve your aim by tweaking some simple settings. Editor's UPDATE: We've added in an NVIDIA settings guide to help you optimise your performance even further. Stay tuned for further updates over time! When you're done here, make sure you check out our main Fortnite: Battle Royale guide, our tips for gearing up and finding loot quickly, and even our guide to unlocking the umbrella! Here’s what settings you’ll need to fiddle around with in order to get the best performance out of your PC. Click the menu in the top right corner, select the cog and choose video settings. Set the Window Mode to Fullscreen. The Display Resolution should automatically be set to your native resolution. For us it’s 1920 x 1080 16:9. If you’re unsure, check your monitor’s resolution online. For Frame Rate Limit, it’s best to go with unlimited. 3D Resolution - Set this to your monitor’s native resolution. View Distance - This isn’t as important as you may think. Set this to medium or above and you’ll still be able to spot enemies from afar. Shadows - For the most part, it’s best to turn this off completely. You’ll see a nice performance increase here that won’t detract from the gameplay experience or put you at a disadvantage. Anti-Aliasing - We recommend going for Medium or above, depending on the power of your rig of course. Medium’s a nice balance for visuals and performance. Textures - Whatever you fancy. If you’re struggling for FPS, set this all the way down. Otherwise Medium or above is fine and it’ll make the game look a little nicer. Effects - Turn these to Low as it’ll make your FPS more stable. Post Processing - Again, set this to Low. Vsync - Generally it’s best to turn this off, unless you’re experiencing major screen tearing. Motion Blur - Turn this off as it can hinder visibility. Show Grass - Switch this off as it can help you spot enemies easier. Show FPS - Depends if you want to track performance or not. Can be helpful when making some tweaks! Remember to click Apply in the bottom right before you exit the options screen. One thing we've started seeing from top players is lowering their screen resolution so it stretches across their screen. While the game won't look as nice from a graphics standpoint, it'll be slightly zoomed in which holds a number of advantages and some disadvantages too. Playing with a lowered resolution means that everything will seem closer, not only making enemies easier to spot but giving them larger hitboxes too. FPS will also be given a nice boost as you won't be demanding as much power from your rig. Downsides to playing with a stretched resolution stem from being zoomed in. Your field-of-view (FOV) will be decreased pretty dramatically so you'll need to be more aware of your surroundings if you want to survive. To give "stretched" a go, all you'll need to do is enable Fullscreen mode and lower your resolution from whatever your native monitor's set at. It's not for everyone, but it could be a game-changer for those who prefer a tighter FOV. Not only is it important to get your in-game settings just right, it's also vital that your PC is in top shape too. This means making sure your Graphics Card's (GPU) drivers are completely up to date, and that your version of Windows is regularly updated as well. 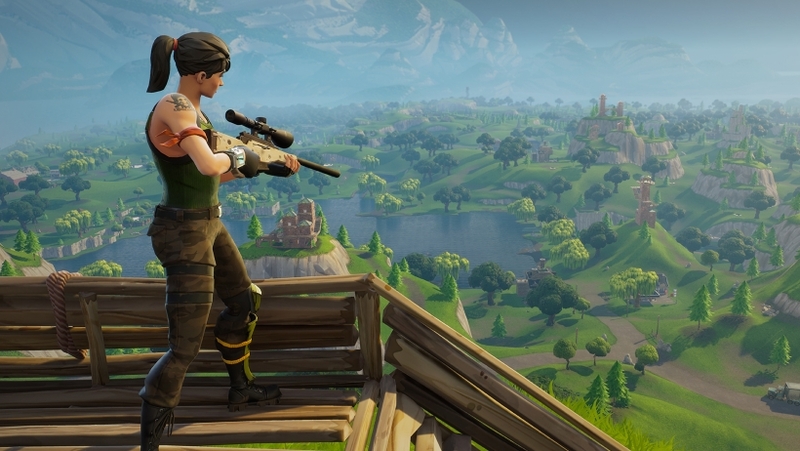 If you have an NVIDIA GPU, then there are quite a few extra steps you can take towards boosting performance in Fortnite: Battle Royale. Open NVIDIA Control Panel and navigate to Manage 3D Settings. Click on the Program Settings tab and find Fortnite. If you can't find it, click on Add and scroll down until you find it. Set Monitor Technology to G-SYNC (if you've got a G-SYNC compatible monitor). Getting your mouse sensitivity right couldn’t be more important to aiding your chances of seeing that victory screen. Do bear in mind though that many of the tips down below are largely subjective. What works for us might not work well for you. Make sure you test out these settings until you find something you feel comfortable with! If you’ve got a mouse that has DPI settings, make sure you tune it to 800 or 400-450. We found the lower you go, the more control you’ll have. It may seem odd if you’re coming from a higher sensitivity, but it’s something you’ll get used to over time and with practice. Otherwise, if you’re using a bog standard mouse don’t worry about all this. Just focus on the next step below. Next, type ‘mouse settings’ in your computer’s search bar and click on the first result. Select ‘additional mouse options’ in the top right and it’ll take you to another screen. Click the ‘pointer options’ tab and uncheck the ‘enhance pointer precision’ box. This ensures Windows isn’t skewing your aim with unnecessary background nonsense. Head into your game settings and you’ll find a whole host of mouse, controlled and gamepad sensitivity bars to toy around with. For PC, we’re focused on all the mouse related stuff - naturally. Mouse Sensitivity - Governs your turn and aim speed when you aren’t scoped in. By default this is set far too high, so put it down all the way to between 0.03 - 0.5. This might seem very low but it works a treat. Mouse ADS Sensitivity - This is your sensitivity when aiming down sights. We have this around the 0.40 - 0.50 mark as it provides a decent amount of control for any firefights you get into. Any higher and your mouse will start flitting around the screen in a heated battle. Mouse Scope Sensitivity - Your sensitivity when zoomed in with a sniper or scoped rifle. We like this a little higher than ADS, especially as you may be swiping across the screen more when focusing on a target running about in the distance. Again, this is very much personal preference. As a final tip: If you swipe your mouse across your mouse pad and your character does a full 360 degree turn in the process, this is a nice indication that you’re on the right track. This isn’t nearly as complex as PC and it works in very much the opposite fashion. As you’ll be using joysticks to maneuver your character and aim, sometimes the default sensitivity settings can make these actions a little too cumbersome. It could be time to crank the numbers up a notch. Controller X and Y Axis - Set these to between 0.75 - 0.90 if you want to be able to turn faster in response to enemy gunfire. Gamepad ADS Sensitivity - This governs the sensitivity when aiming down sights. You’ll want this lower and sitting roughly between 0.50 - 0.70 for optimal accuracy. Gamepad Scope Sensitivity - This is for when you’re aiming in with a sniper for example. Set this a little higher than the average, roughly between 0.75 - 0.90 depending on whether you’re wanting to quickly snap to enemies or go for a more measured shot. Gave me a good idea that my sensitivity is way too high comparing mine to the pros settings in addition what you have in this article. My aim got way better after lowering my DPI & sensitivity so everyone should do that.